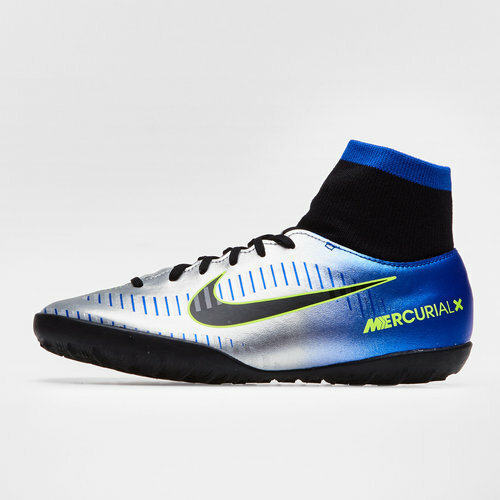 Lead your small sided team to victory on turf pitches with the MercurialX Victory VI Neymar D-Fit Kids TF Football Trainers in a Racer Blue, Black, Chrome and Volt colour design from Nike. Fresh from Neymar's latest collection these Victory VI football trainers feature a split tongue design for easier access and increased comfort. This combined with durable, soft synthetic that features padding around the heel and ankle, make for a comfortable and secure fit. Optimised for turf pitches, these Nike football trainers include a full-length TPU outsole that provides greater acceleration and grip. With a non-marking sole, you'll be leaving only a metaphorical impression on the pitch as you dart across the 7-a-side pitch in training, competitive matches and casual games. Simple yet effective in the small sided game, light up every game you play in by lacing up a pair of these Nike MercurialX Victory VI Neymar D-Fit Kids TF Football Trainers.